I spent the day perfecting my skid, or rather learning how to skid. It is not easy and I still have much to learn. Yesterday I posted a tutorial on how to skid. 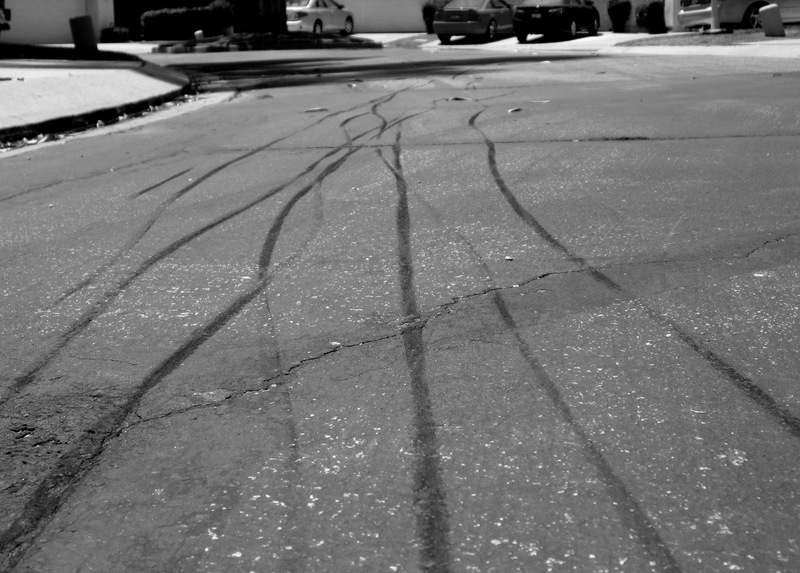 I found it very helpful and since I've been riding fixed, I figure its time to learn how to properly skid. I can skid fairly well by throwing my weight forward but, other than looking cool, it does very little in the way of actually stopping me. And not to mention, throwing your weight forward while bombing down Mt. Baldy is not a very comfortable feeling. I have seen other guys lock their legs up instantly and I've often wondered how they do this. The trick seems to be lifting up with your dominate leg, while simultaneously pushing down on the other AND (This is the key) having your knees/inner-thighs pressed into the middle of the top tube. Night and day! Skidding becomes much easier. I am certainly not ready to go brake-less, but yesterdays tutorial was VERY helpful.